Is anyone else unsettled by the amount of tasty, drinkable beers there are these days? Once, a voluptuous glass branded with the words “Stella Artois” was enough to make you think you were in an establishment that really knew its beer. Now, take your pick: bottles and cans, or pints or jugs, from cask, and, increasingly, keg. Perhaps “choice” is what put me off the keg-happy craft beer scene to begin with: choices between the bright, popping, tangy flavours; the myriad colours and labels. One thing was constant: They were all seamlessly tasty, or at least interesting, and chilled. They’d even started becoming as affordable as the other beers. Yet the term “craft beer” floated around in my mind as some kind of post-subcultural access point to bourgeois hedonism. As a drink it was a digital download—hops bright like pixels, a citrus finish as crisp and as crunchy as a GIF—of a world that seemed a little too pleased with itself. There is something intangibly morose in cask-made “real” ale that you can’t find in cans of craft beer—this bitter, smelly thing that has the potential to be rancid, but most of the time feels pretty affirming. Samuel Beckett as opposed to craft beer’s Malcolm Gladwell. There is currently a raging debate within the world of beer about what’s better: cask or keg. Most small brewers I’ve talked to aren’t prepared to say either way—after all, they often sell both—but you could tell that the keg provides a more preferable situation in that it is more reliable. Beer in a cask has to be consumed within six weeks; with kegs, it’s six months. Ale drinking, and the wooden casks that facilitate a good sup, go back to the days of coaching inns and further, but with pure economics, the keg wins out. London Fields Brewery started brewing the day the London riots started, growing from a kit-based small concern to producing 80,000 litres a week, growing from two to 50 employees in three years. The wood-furnished tap room functions as an impromptu office for staff for much the working week. They make six core beers, and a range of seasonal beers, packaged with colourful labels designed by local artists. I am given a half of “Grapefruit Dead,” a seasonal beer from a keg. It’s bright, as you would expect from a craft, and indeed it suits the summer in that it’s cool and refreshing and fruity. Wild Card Brewery is situated in an industrial estate in northeast London, just a few minutes walk from the jewel in Walthamstow’s estate agent crown, a conservation area known, inevitably, as ‘the village.’ Like London Fields, the converted unit is put to dual use—on one side is the boiler, the masher and the kettle; on the other, a makeshift but sizeable bar, complete with furniture sourced from family and a wood-burning stove for the winter. In many ways real ale is the drink of the measured English romantic. The cricket, the pint, the sun out but with a light chill that leaves one able to wear tweed. It suffers from these associations—petite Nigel Farages with their fag and their just-below-room temperature pint, cradling it like some kind of portal to a colonial England; that scuffed presentation case of Old Speckled Hen sitting in the reduced section of a department store after Fathers’ Day alongside Iron Maiden socks and a baseball cap that reads “IAM THE STIG”. Often when you are sticking up for real ale, you feel you might also be sticking up for real women and real men and real Britain and all the other prefixes that scream of a base need to make sense of his (and it’s always his) surrounds. 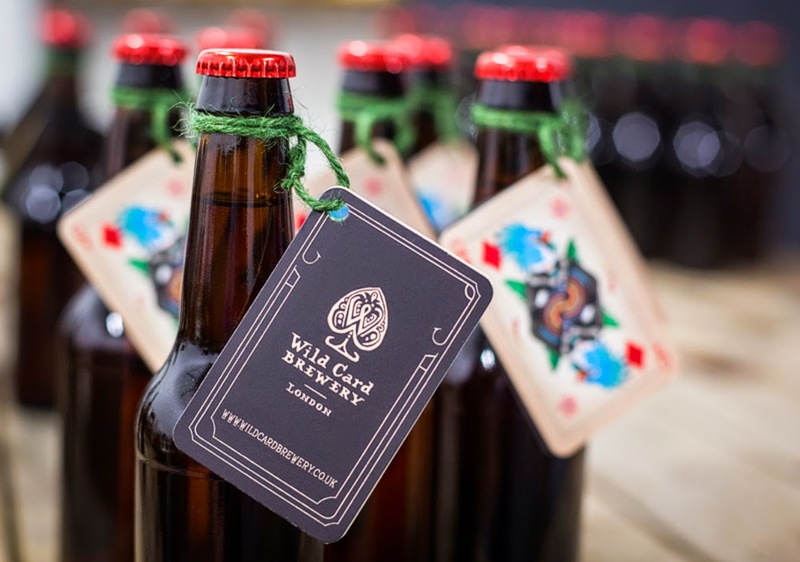 Wild Card is growing as fast as it can, while abiding by its status as a London Living Wage Employer. “It’s very difficult to access credit, which puts the stoppers on you, slows you down, which I guess stops you making mad decisions like borrowing money for a 60-foot brass bar.” The Wildcard brief is to make a limited a range of stuff, really well, all the time. “It might be a Nottingham thing. I know blokes who’ve had a bad pint of something and never drunk anything produced by that brewery ever again in their lives. 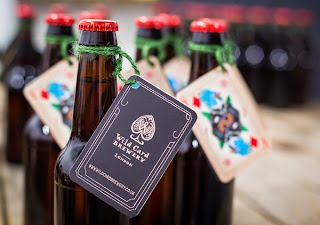 ‘Ten year ago I had an awful pint of that in the Crown…’ I like the idea of something that you can always get hold of and is always reliable.” Wild Card make two main beers. 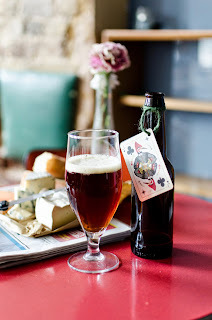 The Jack of Clubs is a 4.5 percent ABV ruby ale, using the British crystal malt, which gives it a Coca-Cola red and a sweet range of flavours. Their second main beer is the Queen of Diamonds IPA, which is head brewer Jaega Wise’s stamp on the brewery. It is hoppy, but not too much like so much craft beer—it’s rounded, velvety and very drinkable. Away from the bluster and bravado that surrounds beer and its varieties, it is this inclusiveness that makes the small brewery scene, whatever the terminology, so irresistible—so real.